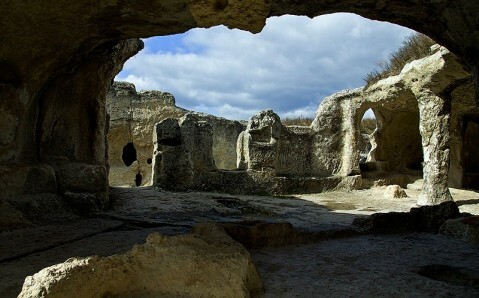 Mangup Kale is the biggest cavern fortress on the Crimean peninsula. 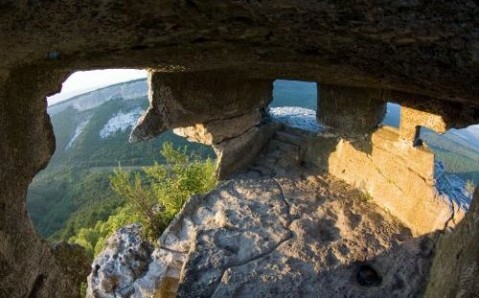 It is located at the top of Mangup Mountain that stands above three picturesque valleys. The plateau, located at the height of almost 600 meters (1,968 feet) above the sea level, has a peculiar form: from above, it looks like a palm with four capes acting as ‘fingers.’ Nature made this area impregnable: on three sides, the plateau is framed by steep precipices, and on the fourth – a deep ravine. 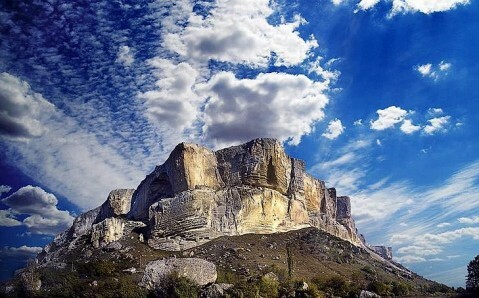 Historians believe that Byzantine emperors built the first fortification on top of Mangup Mountain in the 5th century. The fortress, named Doros, was the main citadel of the Crimean Gothia at that time. In the 13th century, the town became the capital of the Theodoro Principality. Well-protected with walls and towers, it was a strong defensive outpost in medieval times. The majority of the buildings that you see on Mangup Kale’s territory today date back to the times of Theodoro. In the 15th century, the town was pillaged and burned by the Ottomans. After that, the Turks rebuilt the fort and named it Mangup Kale (‘Fort Mangup’). Until the 18th century, it was the base of Ottoman rule on the peninsula. 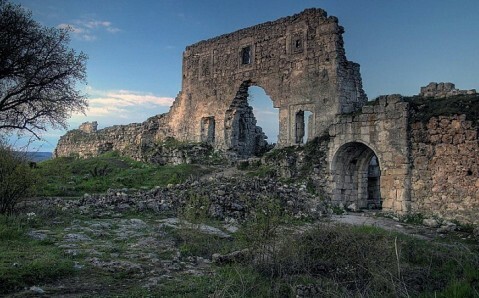 When Crimea became a part of Russia, however, its last dwellers, the Karaites, left Mangup Kale and the town went to ruin. The citadel, in which stands the palace of Mangup’s first rulers, remains until today. You can see the ruins of the defensive walls with towers around it, which even today look majestic. 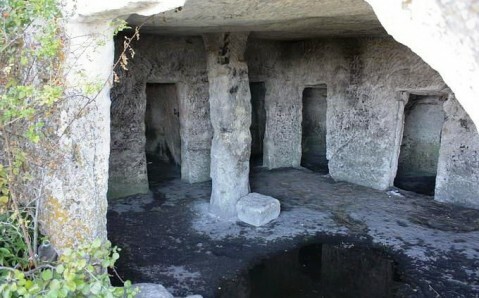 Another attraction of the Mangup Kale are its caves, the biggest and the most unique of which is Baraban Koba. There is a column inside it, and if you hit it, it makes a drumming sound. 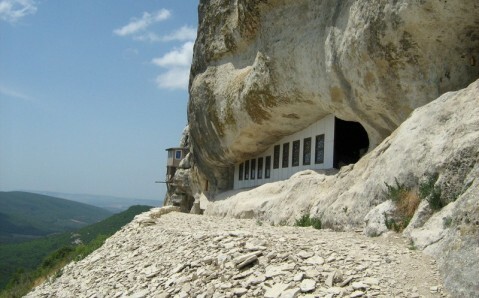 Located on the mountain steeps, cave monasteries and temples are of special interest. Traces of ancient fresco paintings remained in one of them, engraved in rock. In the ravine, you can see the remains of a Karaite cemetery. Getting here. 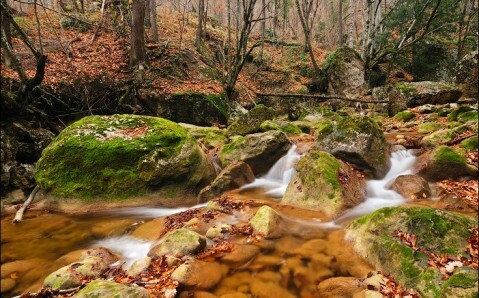 Mangup Kale is located 22 kilometers (13.7 miles) from Bakhchisaray, near the village Khodga Sala. You can reach the village by bus (40 minutes, 7 grivnas).